Xangsane, Ketsana, Conson and Nesat—locally, Milenyo, Ondoy, Basyang and Pedring—typhoons that ravaged most of the Philippines in 2006, 2009, 2010 and 2011, respectively. In September. During the week of my birthday...well, except in 2010. Fun. 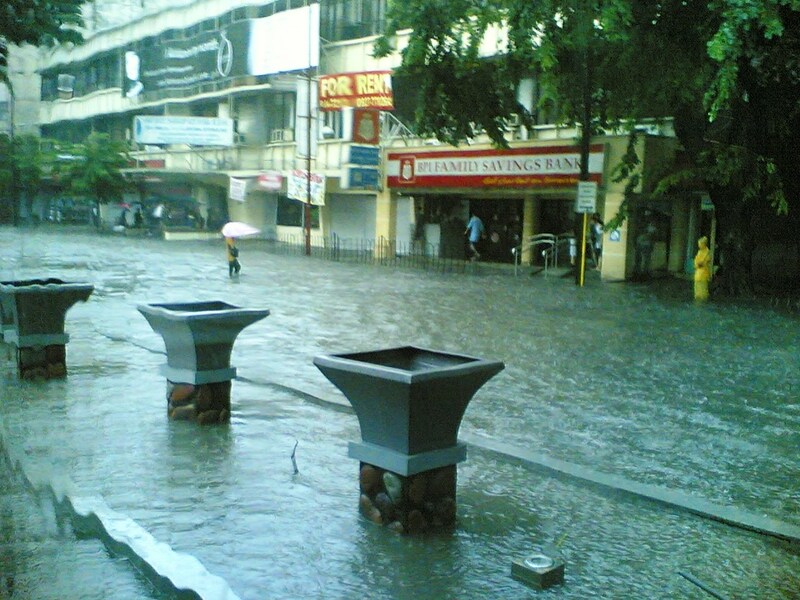 I don't really remember much of the whole Milenyo incident, but everything about Ondoy is still pretty clear to me. I was almost two years into my employment with my first call center and I had just decided I wanted to spend more of my time studying Spanish than commuting to and from work, so I rented a house in Mandaluyong with my high school friend Carlo, a nurse, and a girl named Sienna, also a call center agent. My Saturday shift had just ended and I was going home for the weekend but I decided to wait for Sienna, who was also heading home, because it was already pouring and she didn't have an umbrella. The bus we rode to Baclaran unfortunately got stranded at Gil Puyat Ave. corner Chino Roces Ave. because of the flood, but between the sight of people trying to wade through the muddy waters outside and Frank Peretti's fantastic novel Piercing the Darkness which I had brought with me, I wasn't so bored. Within an hour or so, I was able to finish the book and take a nap. When I woke up to find we were still at Magallanes Interchange, I agreed with Sienna that we should just stop wasting time trying to go home and just return to our rented house. I let Sienna go ahead by MRT at the Magallanes station because the car for women and the elderly was fairly empty, and we couldn't have possibly succeeded in getting ourselves inside any of the other cars had we insisted on going together. I texted my dad to pick me up where I was but he eventually relayed news that he couldn't get through the flood to come get me. I rode a bus to Mandaluyong and arrived at our rented house to find that there was no electricity. It was my dad's birthday and the following day was mine, and thankfully I was able to finally get home then...to a house that had just gotten flooded. Basyang of 2010 wasn't so bad and it didn't really occur on my birthday. It was mostly strong winds, which resulted in a lot of fallen tree parts and missing roofs, but the rain didn't really cause any serious flooding...in the areas I had to go to daily, at least. 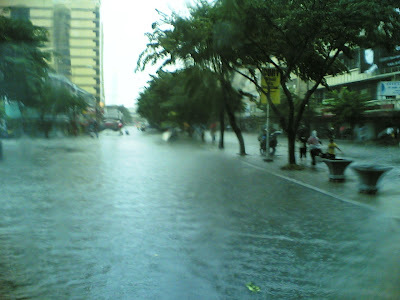 It was bad enough, however, to cause me and my friend one early morning to abandon our plans of going to work together as there were no buses leaving for Baclaran. We simply decided to wait out the storm at my friend's place, and that was the moment we would later refer to when we talk between ourselves as the night we became a couple. The whole shebang's deserving of its own blog post, maybe even a romance novel, but two months thence, just a week before my birthday, the love story, inevitably and unfortunately, came to an end. My first serious relationship, over in such a short time, resulting in my very first almost paralyzing heartbreak. The whole romantic shiz might not be for me after all. Pedring wasn't so bad either but though my birthday this year fell on my rest day, I still wasn't able to celebrate by going out with friends. I was home alone with my books and my mom who baked me a blueberry cheesecake just to cheer me up. In less catastrophic news, Zuckerberg and his team of geeks recently updated Facebook. Now you have a news feed within your news feed and you can tweak more settings for your privacy. The way these updates usually go, some privacy settings automatically get changed, and for me one of them was that posting to my wall got disabled. 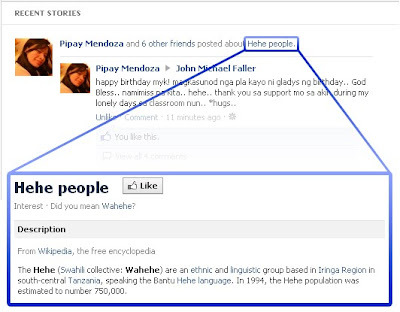 Two weeks earlier I had changed my birthday on my profile because I didn't want my Facebook wall flooded by birthday greetings from people who wouldn't normally greet me without the social networking site reminding them, and this along with my wall being inaccessible filtered the greetings from my friends. Those who really knew my birthday sent me their greetings through other modes of communication. People eventually started posting on my wall after I had enabled the option though. In hindsight, it could have very well been the perfect Let's-See-Who-Actually-Remembers-My-Birthday-Without-Help-From-Facebook experiment. 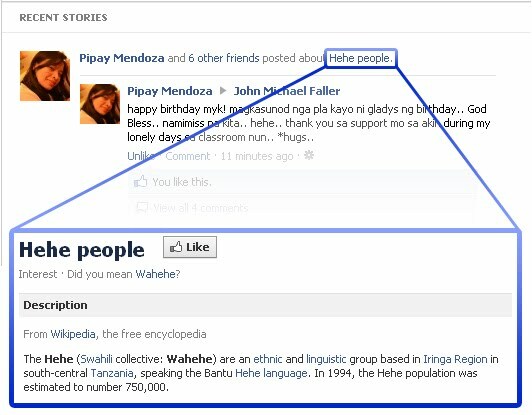 More interesting than the results of the accidental experiment, however, was how Facebook recognized the birthday greetings on my Facebook wall as posts about "Hehe people," which is "an ethnic and linguistic group based in Iringa region in south-central Tanzania, speaking the Bantu Hehe language." What the heck. So...happy birthday to me. Hehe.